I'm trying to cook this week with what I have on hand in our kitchen. 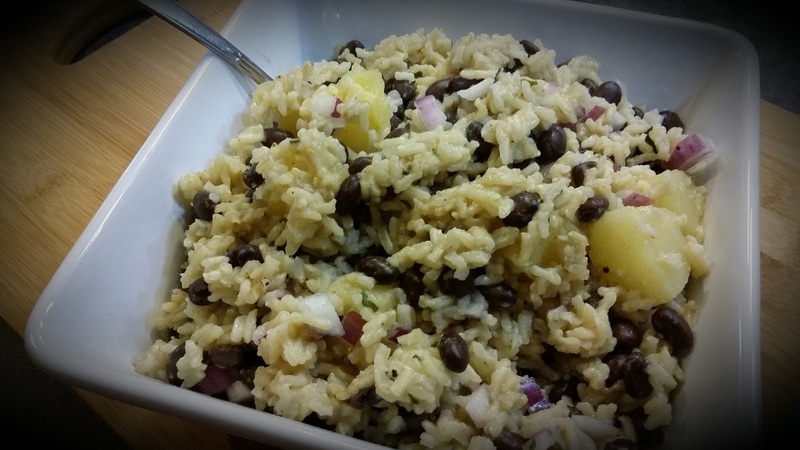 Most of the ingredients for this yummy and fairly easy dinner came from my freezer or pantry. The only "fresh" ingredient was the red onion. Hey! It happens. Not all of us have time to constantly go the grocery store, right? I've been spending way too much money at the grocery store lately, anyway. It's time to use the food that needs to be used up in my house. As much as I'd like to try to stay away from canned goods, they do make life convenient sometimes. *Sigh* They're so easy to stock in our kitchen pantry. 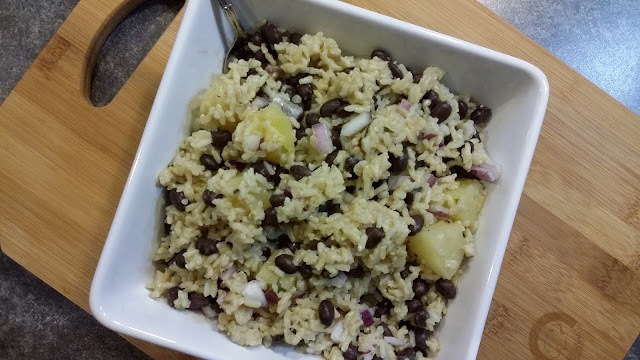 Pantry items for this: Chicken broth, quick cook brown rice, canned black beans, canned pineapple. I love keeping quick cook brown rice in my pantry. Rice can be so versatile. 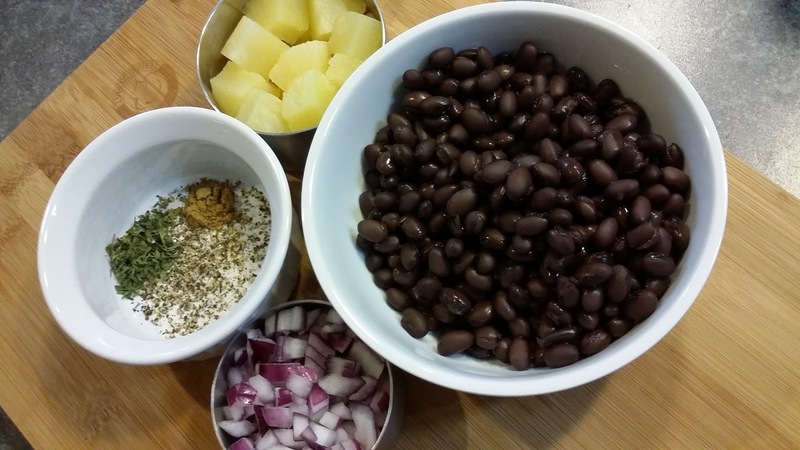 And although cooking dry beans is healthier for you, canned beans are just so darn convenient. Just so ya' know. . . . I do actually have bags of dry beans in my kitchen pantry, too. Ask me how often I cook with them? I should really start doing it that way. I KNOW it's healthier. I just need to get back into a schedule and start meal planning again so that I can work dry beans into the plan. I pulled salmon out of the kitchen freezer and had no idea what I wanted to do with it. For some reason, pineapple popped into my head and sounded good. So, I went with that theme and came up with the pineapple black bean rice and pineapple marinated salmon. Put chicken broth, olive oil and rice in medium saucepan. Bring to a boil and then cover and reduce heat to low. Simmer for 15 - 20 minutes. All water will be absorbed when it's time to turn it off. Check after 15 minutes if your stove cooks hot. Turn burner off when all water is absorbed and let rice sit for 5 minutes. After the 5 minutes, sprinkle the cumin, black pepper and parsley on rice and fluff seasonings into rice with a fork. Add the red onion, pineapple and black beans and mix gently until everything is mixed throughout. About 1 pound of frozen salmon fillets, thawed (4 fillets). Place salmon fillets in a shallow bowl and sprinkle with black pepper. Mix together the pineapple juice, soy sauce, olive oil, onion powder and parsley. Pour pineapple juice mixture over the salmon. Timing of Meal Planning: I marinated the salmon before I began preparations for the rice. I started cooking the salmon when I turned the burner off for the rice and it was about to sit for 5 minutes. After the rice is done cooking and the salmon has been marinating for 30 minutes, heat the 1 tablespoon of olive oil in a cast iron skillet over medium high heat until it's hot. Sprinkle black pepper into the pan evenly. Place the salmon skin side up in the pan and cook for 1 minute (take salmon out of marinating bowl, but save the marinade). Flip the salmon and cook skin-side down for 1 minute. Add the marinade into the skillet and cover the skillet with a lid. Reduce heat to medium-low and cook for 5 - 8 more minutes. Fish is funny. It can go from undone to overcooked in a matter of a minute. I checked mine after 5 minutes and it was still a little cool on the inside and not quite flaky yet in the center. I gave it another 3 minutes and it was cooked perfectly. This salmon was really flavorful. Place rice in a medium sized serving dish and place salmon fillets on top. 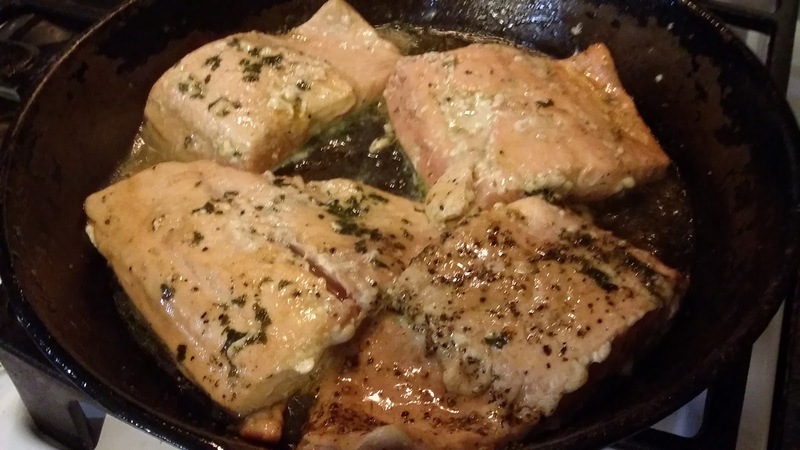 What is your favorite way to cook salmon? Is there anything you keep in your kitchen pantry for easy meals?